Ralph Lauren's RRL Leather Varsity Jacket Navy/Yellow. I want this jacket more than anything right now. The japanese website reads the MSRP @ ￥93,450 which translates into just shy of $1,000. (yes, you read that correctly.) Believe me, if I was stupid enough to spend that kind of money in a recession, It'd already be mine. 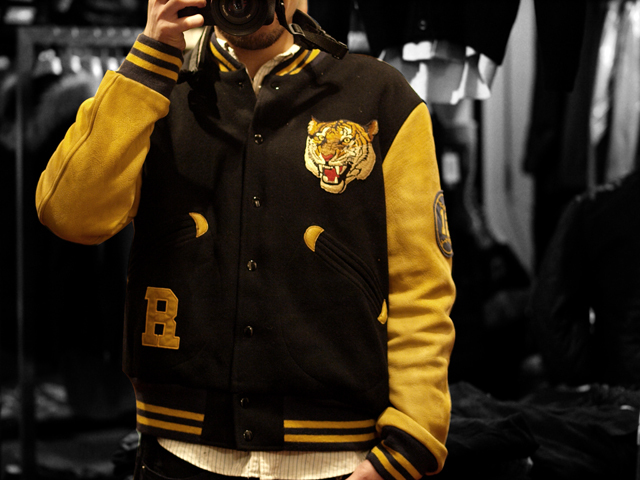 Paying $1000 for a varsity jacket is absurd. I'm sorry and maybe I'm not fashion forward enough to see how much more a slightly stylized varsity jacket is worth over a $150 one by Holloway, or DeLong. Both who make much more authentic versions of the classic varsity jacket. Besides the varsity jacket goes in and out of style quicker than a summer in Minnesota and usually won't come back in style for another 10 or 15 years.